It seems that Acell can regenerate (or simply generate) news articles. From a very small achievement, they are able to regenerate a full blown hype. In this regard, we can say that Acell’s ECM works wonders. The story is old, but it is good to remember it now, in the context of the recent Hitzig’s “breakthroughs” using Acell. in the link, replace “bullshït” with the correct word without little dots. Badscience talks about this Acell “breakthrough”. Very interesting read. Don’t miss the readers comments at the end too. Professor Stephen Kaye, a consultant plastic and hand surgeon at Leeds University, poured cold water on Dr Badylak’s claims. Dr. Badylak (Acell) says that it was Lee Spievack who went to the press, and Acell apparently had no intention to make this public. Do we believe Mr. Badylack? Dr. Badylak also says that the entire nail bed, and half the distal bone were cut off, in clear contradiction with the pictures. Do we believe Mr. Badylack? Now firstly, if you look at the pictures accompanying this column, you will see from the “before” image that there is no missing finger, so we might naively intuit that there is no “missing finger grows back” story to be written. In fact, from the grainy images and scant descriptions available - despite blanket news media coverage, including television interviews - it seems this bloke lost about 3/8 of an inch of skin and flesh from the tip of his finger, and the nail bed is intact. Reconstructing the media frenzy, it all seems to have kicked off - this time around - with BBC New York correspondent Matthew Price doing a very credulous set of interviews that went live on the BBC site on Wednesday at 3pm. He nods endlessly and says “that’s astonishing” when the company founder’s little brother tells him that the tip of his finger healed. 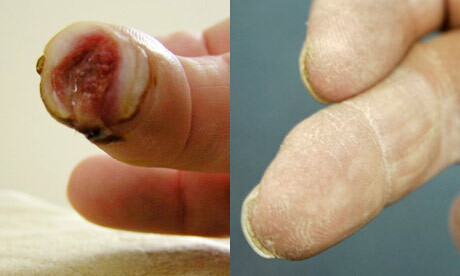 In the computer animation used by the BBC, a finger miraculously grows back more than half its length, at least two joints worth. At 11:30pm that same day the Press Association put out a story, but the newspapers must have had it sooner for the next day’s papers, so I guess they lifted it from the BBC, too. By May Day 3:30pm the story was on Fox news (their morning), and by 11:30pm it hit ABC Australia. All used the same quotes in different permutations. And that’s how news works. The last time this board was in a tizzy over this junk, I provided a link to a REAL study that showed that fingertips can regrow themselves without the help of any sort of “pixie dust”. Of course the true believers paid no attention to what I posted. It’s interesting that the Guardian article refers to Acell as “a large and longstanding biotech firm”. Large? From the website it doesn’t really look that large. My guess is they have around 30-40 employees at the most. Longstanding? Their press releases go back to 2004, with nothing on the site before that. Don’t know when they were founded, but it’s not likely that it was very long ago. I believe that what Acell does is adds a synthetic element to the microscopic matrix, that is it helps the fibroblasts and other cells, by adding to and augmenting the matrix. With the Acell granules, instead of just relying on the natural matrix made up of fibroblasts and the “fibrin” molecules they secrete, you also have additional matrix. So this might speed up wound healing and make the wound heal much, much metter. The scar might be much smaller in width. So if you have a gash on the skin that would normally cause a 3 cm wide scar, now maybe the scar will be only 1 cm in width. But grow hair? It seems to me that what Acell does has ABSOLUTELY NOTHING TO DO WITH GROWING HAIR. All it does is promote better, faster healing of the wound. But it doesn’t fundamentally CHANGE the healing process. It doesn’t add any hair-growing or hair-inducing cells, and it doesn’t stimulate them in any way. It doesn’t send any signals or orders to stem cells telling them to “grow hair” all of a sudden. For god’s sakes, it’s a simple powder composed of microscopic, grainy matrix-like substance. It doesn’t change the biochemistry of the skin. The scar that is formed will still be hairless. And just becasue you now have a “thinner” scar, that doesn’t mean that NEW HAIR grew on either side of the scar (i.e., as in HM or hair cloning.) All it means is that the tissue on the sides of the wound grew were kind of stretched further and an increased healing process at the wound side caused less fibrin to have to be used, resulting in less scar tissue and a “smaller” (i.e., thinner) scar. It may give an ILLUSION that new hair is growing, but no new hair is actually created because it cannot do this. I have gathered a bunch of photos on this case. It seems that the Acell guys are lying like demons. 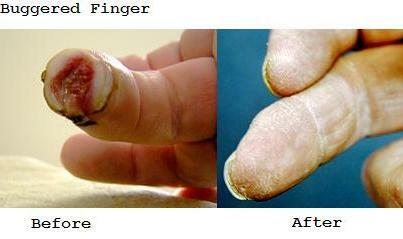 -Only a small portion of the last segment of the finger was cut off. A good portion of the nail remained intact. Other doctors who commented on the pictures said that bone was intact, and no tendons or nerves were affected. 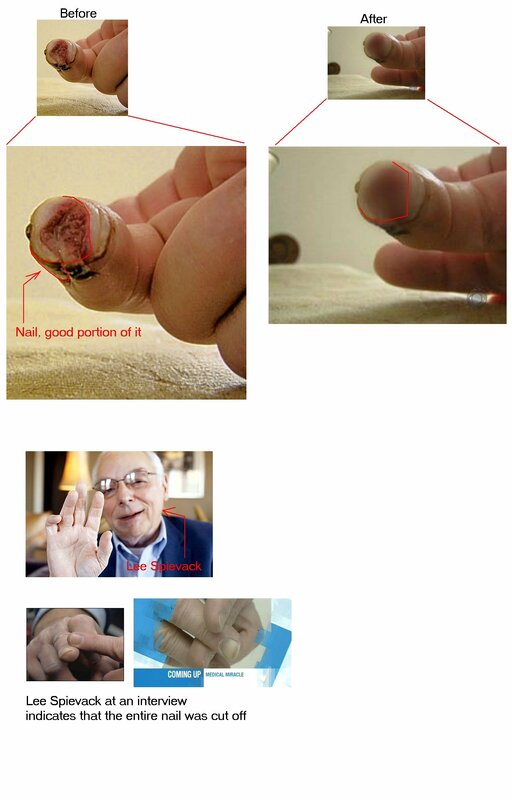 -But Lee Spievack, in an interview, gestures, and indicates that the last segment of his finger was cut in half, and all the nail was gone. -Dr. Badylack also says that the entire nail bed, and half the distal bone were cut off, in clear contradiction with the pictures. ps: Lee Spievack is the patient. SD, when you say “phallanx” are you referring to the tip of the digit (skin and all) or to the bone inside it? If you look at the “before” photo, there is no bone showing whatsoever. So that means the wound must have been really superficial. Because when I look at my own index finger, and feel where the bone ends, it ends probably only 4-5 mm from the skin. So the wound in this case must have been only around 2-3 mm at the most. The picture looks really gross, but it’s not a severe wound. I was using the word “Phalanx” incorrectly. I have edited the post. I think it is ok now. I thought that phalanx=segment of the finger, but it means just the bone inside that segment. (and also, it is phalanx, not phallanx as I spelled). edit: fortunately I have been able to edit the original post too. » and all) or to the bone inside it? » If you look at the “before” photo, there is no bone showing whatsoever. Do you mean that the scar is thinner because contraction is higher? I speculated with this possibility in other posts, but I was not sure because I am not an expert, and I haven’t researched deeply into this. When I saw the animal pics posted by Acell at their website (now someone have said that Acell has removed them…), I researched a bit and found out that wounds contract as they heal, so I thought it was possible that fur was contracted, pulled inwards, rather than regrown brand new. » they have around 30-40 employees at the most. » that it was very long ago. » complex process involving millions of microscopic cells and enzymes, e.g. » adding to and augmenting the matrix. » wound heal much, much metter. The scar might be much smaller in width. » scar, now maybe the scar will be only 1 cm in width. » created because it cannot do this. Yes, I mean the scar is thinner because Acell promotes better wound healing which is less reliant on fibroblasts and fibrin, and more reliant on their own artificial matrix. The less fibrin, the less scarry tissue will result. The less scarry tissue, the smaller the final “wound”. The skin on either side of the wound is essentially being stretched a bit more, but no new hair-bearing tissue is growing and no new follicles are being created. Evaluation of ACell Hydrated Wound Dressing for Autogenous Skin Donor Sites - Full Text View. It seems that the US army did a clinical trial on ACell Hydrated Wound Dressing, and was not satisfied with the result. They decided not to use this product for treating burned patients. Apparently, this dressing is applied on the donor area. It seems that this is an ECM product. There are no other Acell trials at clinicaltrials.gov. Does this mean that the US army is not testing any other Acell product? » this product for treating burned patients. » Apparently, this dressing is applied on the donor area. » It seems that this is an ECM product. Question: Why is it when I do a search on Clinicaltrials.gov for “Aderans”, “Androgenetic” or “Alopecia”, does the ARI study not come up, if they are currently operating clinical trials in the US? It looks like every other recent trials shows up on searches for “baldness”, “alopecia”, etc., including a bunch for the HairMax LaserComb, Botox for hairloss, finasteride, Avodart, minoxidil, etc. but NOTHING about Aderans! ACell Inc. is a privately held company funded by private investors. If you are a qualified private or institutional investor and would like to know more about investing in ACell please contact Jim DeFrancesco, CEO at 800-826-2926. They desperately want to sell their company hoping some bigger fish will bite and acquire them. Because they know they got nothing but a cool idea and bunch of powder that does fukc all. If they ever decide to go public I bet their stock price would stay ~ 0.1 or 0.2 cents for a very long time as a venture company. I thought that this site was about government-sponsored trials, but you are right, there are all kind of trials, and not just in USA. There is a trial about treating baldness with Botox, and comes from a Canadian firm. I dunno why Aderans trials are not listed there. Follica and Histogen are not listed either. ARI should be listed. It seems that this list in not very complete, and we cannot conclude much about the lack of Acell trials in the list. well, we know that, in that particular trial I posted, the US army rejected the Acell product. » » this product for treating burned patients. » » Apparently, this dressing is applied on the donor area. » » It seems that this is an ECM product. » they are currently operating clinical trials in the US? did you know that ACells’ chief scientific officer, Dr. Stephen Badylak, is a Board Member of HISTOGEN Inc. too? Time to start the next ACell crap topic - eh? Iran_Man is new in this board, registered just a few days ago, and dedicates 90% of his efforts to defend Acell. p.d. If Badylack is also cooperating with Histogen, thats another reason to doubt Histogen too. Thanks for the info.